"Mr. J.M. Wallace, of Arkansas, visited his relatives and friends in this county for the last three weeks and returned to Arkansas Tuesday. Mr. Wallace left this county when a young man, in 1874, for his adopted state and this was his first visit to his native state since he left. He has been successful and has accumulated considerable property and has been honored several times with office." *Note Much of the following biographical sketch is quite embellished. "J.M. Wallace has ben occupied as a farmer and stock-raiser of Fourche LaFave Township with good results. A native of Carthage, Moore County, N.C., he was born on March 4, 1850 his parents being Isham and Nancy Wallace, both born in the same state who were the parents of fifteen children, eleven of them still living: William W. (residing in North Carolina, where he is a farmer and has been sheriff of Moore County for three terms), Quimby (a farmer and residing in the same county), Emsby (a farmer also of the same county, who represented them in the State Legislature in 1868), S.D. (a farmer and at one time sheriff of the county), V.A and Samuel B. (both farmers of Moore County), Clarkie (wife of George Corkman), Sarah (wife of John Garner), Hettie (wife of James Horner), Marty (also married), and all residing in Moore County. The father of these children died Jun 15, 1885, his wife following him on August 3, 1886. J.M. Wallace remained with his father and attended public schools at Carthage in his youth, and when eighteen years of age went to college at Greensboro, Guilford County, N.C. He afterward taught school for about two years, and then moved to Little Rock, Ark., where he entered into business and from there to Texarkana, where he engaged in the cigar business. He again returned to Little Rock, but not remain long before he moved to Dardanelle, Yell County, and from there to Perry County, where he took charge and conducted a saw-mill. From Aplin he came to Perryville, where he bought a farm of eighty acres, with about fifty-three acres under cultivation, and has resided these since. On December 3, 1875, he was married to Miss Emma Mitchell, a daughter of William Mitchell, by whom he had one child: Byrdee (born Jun 1877, and dying in August if the same year), the mother dying some time afterward in Texarkana. Mr. Wallace was again married, his second union taking place August 3, 1881, to Miss Dora Laughlin, a daughter of S.H. and I.F. 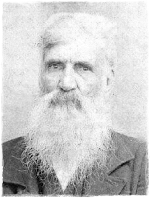 Laughlin of Perryville, by whom he had five children: Ernest I. (born Jun 13, 1882), Myrtle (born December 13, 1883), Jessie (born August 15, 1885), Johnie Ellen (born December 27, 1887). Mr. Wallace became well and favorably known after a short residence in Perry County, and for two years was constable of Fourche LaFave Township, during which period the county was without a sheriff. He and his wife are both members of the Methodist Episcopal Church, and in politics, Mr. Wallace is a strong Democrat and a valuable support to that party."